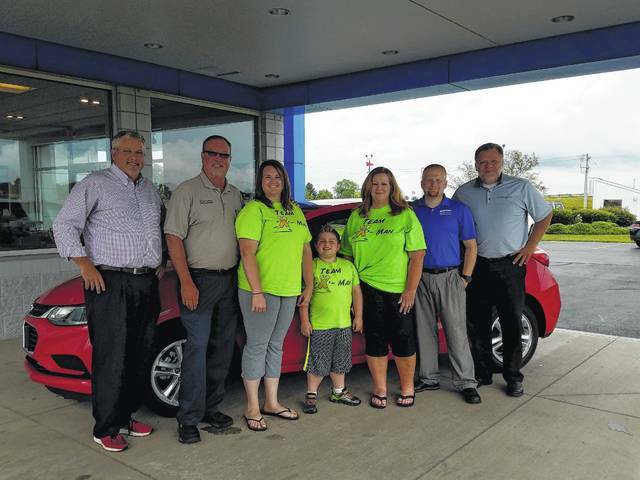 Gusweiler GM Center recently agreed to donate a vehicle as the prize for a hole in one contest during the upcoming Muscular Dystrophy Association Shoot for a Cure: Golf Scramble on Sunday Aug. 6. This event, organized by Team X-Man, is sponsored by Gusweiler GM Center and Shane McMahon, State Farm Insurance. Pictured (L to R): Shane McMahon; Gusweiler GM Center General Sales Manager Rick Fagan; Team X-Man members Ashley Swiger, Xavier Swiger and Ronda Turner; Gusweiler GM Center Sales Consultant James Reese; and Gusweiler GM Center Sales Consultant Mark Bottorff. “Team X-Man” will hold its first golf outing to raise funds for the Muscular Dystrophy Association (MDA) on Sunday, Aug. 6. Sponsored by Gusweiler GM Center and Shane McMahon, of State Farm Insurance, the MDA will benefit from an upcoming “MDA Shoot for a Cure: Golf Scramble” fundraising golf outing. Organized by Wayne Turner and his wife, Ronda, the couple have been working for years to raise money in an attempt to find a cure for muscular dystrophy (MD). Their grandson, Xavier Swiger, a Miami Trace student, has been suffering from MD for several years and Turner said Xavier travels regularly to Children’s Hospital. It was because of him that the family decided to form team “X-Man” to support not only Xavier, but all children suffering from MD. Turner said that the community is invited to participate and can do so by filling out and returning a registration form. The form will allow a captain and three friends to create a team for $50 a player, $200 total. This price includes a meal, cart, a round of golf and a raffle ticket for the chance to win one of many prizes donated by locals. Additionally, businesses can sponsor a hole for $100 and advertisements at the event will feature these businesses. Turner said that registration forms and hole sponsors need to be returned by Aug. 1, but asked that they be returned as soon as possible. The event will be held at The Greens at 703 State Route 41 in Washington Court House. Team check-in will start at 12:30 p.m. on Aug. 6 and teams will tee off at 1:30 p.m.
Turner said that 100 percent of the proceeds will go to the MDA. These funds will not only go toward finding a cure, but will also help send kids who are suffering from MD to fun camps. During camp, the child has a chance to come out of his or her shell, become a little more independent, and enjoy a plethora of activities, but are watched on a one-on-one basis by a counselor throughout to ensure a safe and fun environment. For more information or to obtain a registration or hole sponsor form, contact Turner at (740) 606-9999.
https://www.recordherald.com/wp-content/uploads/sites/27/2017/07/web1_20170706_165857.jpgGusweiler GM Center recently agreed to donate a vehicle as the prize for a hole in one contest during the upcoming Muscular Dystrophy Association Shoot for a Cure: Golf Scramble on Sunday Aug. 6. This event, organized by Team X-Man, is sponsored by Gusweiler GM Center and Shane McMahon, State Farm Insurance. Pictured (L to R): Shane McMahon; Gusweiler GM Center General Sales Manager Rick Fagan; Team X-Man members Ashley Swiger, Xavier Swiger and Ronda Turner; Gusweiler GM Center Sales Consultant James Reese; and Gusweiler GM Center Sales Consultant Mark Bottorff.